With the new Ranked system coming out I wanted to practice up picking LeBlanc in Draft Pick Mode. I had just lost two games in a row to heavy teams and I needed a win. LeBlanc is a good option for a free win. Luckily, for me, despite being last pick my team allowed me to play AP mid. I know that pick order doesn’t mean anything in a Draft Mode Normal, but it was still nice of them. The enemy team picked Kassadin. I had always wanted to see the LeBlanc vs Kassadin matchup, and I wouldn’t trust anyone else on LeBlanc. Kassadin refused to harass me in lane. I was very careful to make sure to get auto attacks in when I hit him with Q. However, it felt like he was baiting me because he wasn’t using his silence on me. I also noticed that Kassadin started a Faerie Charm and eight health potions. He was hoping to just out-last me in lane. I immediately started saving up my mana. I knew that once I hit level three I could kill him with some good burst if I had enough mana. My jungle Shen came by, so I decided it was time to kill Kassadin. Before Shen could get close I blew Kassadin up. Shen just laughed and helped me shove to turret. I recalled and got some very early AP. I got back to lane the same time that Kassadin did, so Shen and I killed him again. This time, Shen was holding the lane, taunted so I could Flash, blink, and then combo Kass. He died before he could get back to his tower. Second blood. Mid was won, so I roamed bottom. I told bot that I wasn’t settling for a Leona kill, I was going to focus Graves no matter what. I came right through the lane as Graves stuck his neck out. Boom, two spells killed him, and we ran right up and finished off Leona for a double kill. I was 4-0, but I wasn’t done. I actually ended up with the first six kills of this game. I had killed Warick, Kassadin, Graves, and Leona. It felt marvelous! I did notice that I spent too much time roaming and not enough time containing Kassadin. I wanted to let me team get back into the game. I knew that eventually the combination of Warwick ulting me and Kassadin silencing me would take me from about full to dead. I actually died to Warwick ulting me. I lost vision of him in a bush after his ult finished channeling, otherwise I could have killed him and walked to safety. Instead, I just winged him, and tried to walk to my jungle where a wild Rumble appeared and dropped an ult on me to kill me. I’ve played Rumble a couple of times and I’ve never noticed his ult deal hardly any damage. I was surprised when it finished me off instantly. Vi is still considered “release week” so she hasn’t been nerfed yet. I guess they had to release a champion that beat everyone. Vi started to get out of control as well. 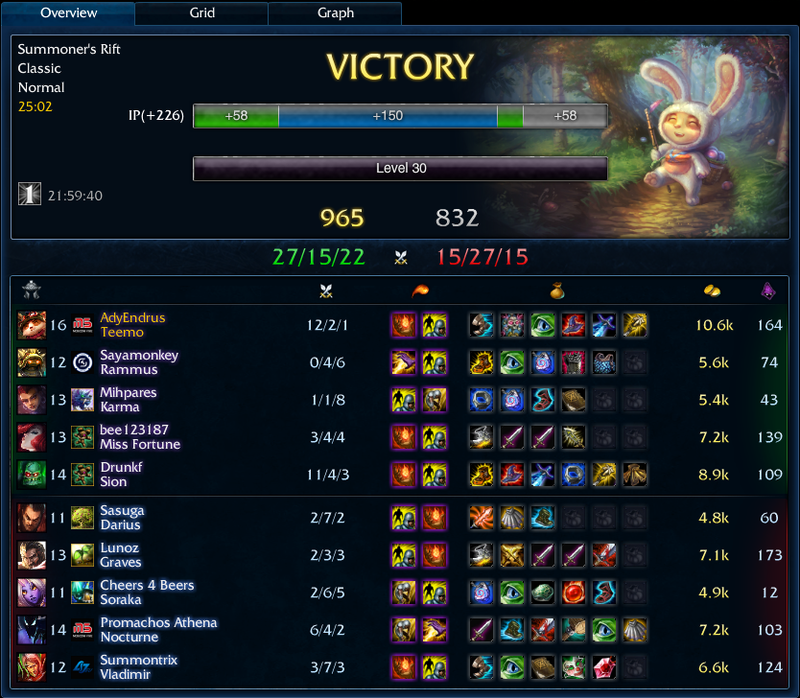 For most of the mid game I gave up my farm to Shen so I could roam and just get people behind. It was great! What a fun LeBlanc game! I swear our team was bi-polar last night. We had two games in a row where the other team made some plays when it counted. We couldn’t get on the same page. We missed objectives, we didn’t team fight, we didn’t communicate. Everything went wrong. Going into the last game of the night I was upset. Like most people I abhor losing. Dropping two games in a row was unacceptable, especially after a 5-1 start with this ranked team. This was a huge motivating factor for me. I wanted this third game to be perfect. We leashed blue for Hecarim and I missed some creep experience in lane because of it. However, Trist can beat Miss Fortune, and Taric can help beat Leona. We had a really good chance in this lane. Miss Fortune let me shoot her in the face a bunch and I landed my E on her a number of times while she was using a health potion. With no sustain and her potions wasted we quickly pressed our advantage in bot lane. Leona kept trying to stun my Taric, which resulted in her over-extending and eating a bunch of free damage from my creeps and me. It was pretty cute watching Leona stun and then Taric stun and then Leona stun again and then Taric stun again. Neither support went for the enemy carry. It was a 1v1v1v1 lane! If that’s the case then I’m glad I’d been attacking Miss Fortune so much! Leona realized too late that she had been harassed too low. A quick jump, E, and ignite finished her off for First Blood. It’s just what I needed after the last two games. There was a strange lull in this game where I thought we were grouping mid, but I showed up late and my team had rotated top. I got caught by Wu Kong and Amumu. They both blew ult to kill me 2v1. I just shrugged, and went back to bot lane. I just farmed and farmed to get ahead. Hit my Infinity Edge and Phantom Dancer. At that point I knew I’d be safe in bot lane because I could just shoot anyone who came to fight me. We did have one big team fight where things went a little strange. We were fighting over dragon. I came from the bottom side while my team was all above. Unfortunately, this meant that I ended up fighting 1v2 against Leona and Wu Kong! With nowhere to run I fought them. Just as I was about to die I dealt a killing blow to Leona and got another jump from it. I jumped away from Wu Kong. I called for help, but my team had moved down into blue side’s jungle, fighting just below Wraiths. I ran from Wu Kong as best I could towards my team. Just as I’m getting near the team fight I’m using attack move, and I get in range of Amumu and auto attack once. Oops. Welp, I got kill credit for that! Oh well! This means I get another jump! My team turns and finishes up Wu Kong and I live to see another day! Did anyone else notice how much gold Iggie ended with? Second highest! This is especially impressive considering Jake held Wu Kong to the lowest gold on the enemy team. A good game for Security Matrix! I am going to show you the score screen from this game, but I don’t want you to get mad at me. I specifically gave this post this title to show you that the other team was having a good time too. I got five honor from this game, three of it coming from the other team. We were having a LAN at my place to practice up for a future AHGL tournament and I needed to have fun. Having fun is an important part of a LAN. We had some good games, I’ll post about that double quadra-kill later, but for this game I had a short discussion with my fellow LAN players. I suggested that each of us play the strongest possible champion for our lane. Team comp was Pantheon with Lux in bot lane. This was something that Jake and Jeff had done time and again. They always love it. I picked LeBlanc for mid. We had Teemo go top. We had Shen in the jungle. Kill lane bot. Ridiculous burst mid. Annoying shrooms top. Over-powered ultimate in the jungle. We knew we would have a good time. Let’s see what we’re up against. This is when my heart began to sink. The other team looked nasty. Akali and Rumble. How can they have both?! Don’t both of those play top? I know Akali is going to kill me mercilessly late game, but I don’t know how I feel about Rumble. Bot lane for the enemy team is Taric and Vayne. Taric has a clean disengage with his stun. Vayne has a great distance creator with her E. Vayne is also running cleanse. The enemy team has a Riven jungle, who also scared me, as she is highly mobile, and normally too thick to burst down quickly. This Riven had won ten of her last ten games as reported by lolking. I was discouraged. Bot lane was discouraged. This game is starting to look better and better. If bot lane could get their feet set I knew it would be a race to most kills. I managed to get First Blood from Rumble. I normally would recall after getting a kill that early, but I hadn’t burnt through my potions yet, so I stayed in lane. By the time Rumble was back I was level four and he was still level two. I took advantage of this level discrepancy and killed him again. However, despite my success in mid lane I didn’t have anyone on my back. By the time I got my third kill on Rumble bot lane was legendary. They had gone to work on Vayne and were just destroying her. This bot lane quickly escalated into late game by keeping Vayne at a monstrous 0-15. I had managed to zone Rumble completely from creeps, keeping him from precious gold and even more precious experience. However, Akali, as expected, was able to take me from full health to completely dead in less than two seconds. My triple blink potential wasn’t enough to keep her off me. I had ventured top once or twice to help secure some kills in top lane, but Akali’s late game is very fun to witness. 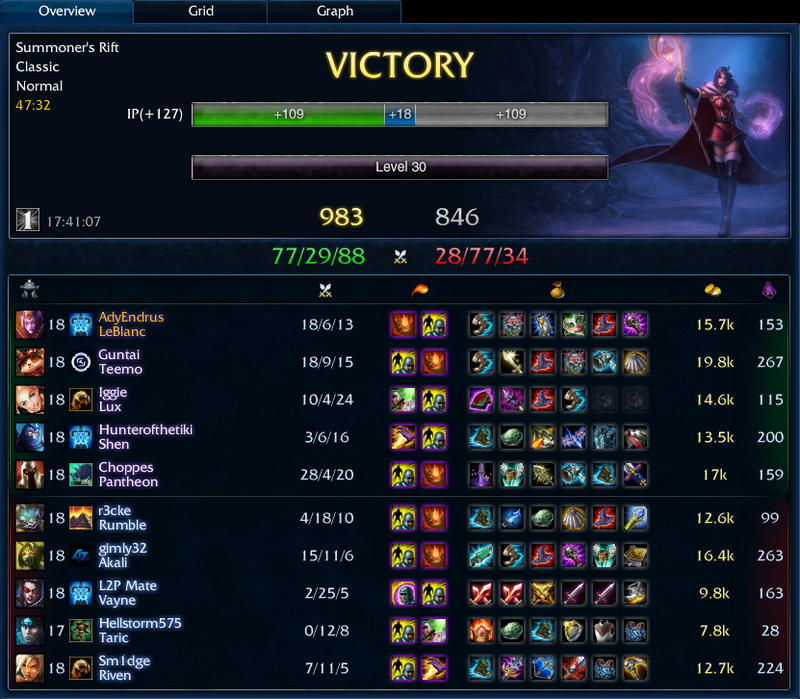 It was around the middle of this game that we had a nasty revelation; Vayne wasn’t worth any money. We found that it wasn’t worth a summoner spell or an ultimate to kill her. She was only granting us about 15 gold per kill. We knew what needed to be done. We needed to sacrifice Lux to the feeder. Vayne felt very comfortable around us by this point. Earlier in the game we had actually cornered her, murdered her support, dropped her to ~150 HP, and then walked around bot jungle with her. Lux, Pantheon, LeBlanc, and Vayne, a lovely looking posse. Lux was in a constant panic after I shouted out “don’t attack her!” to the guys in the room. Vayne eventually stopped walking and just started to recall, three enemies within a ranged auto attack’s distance. I tried to tell her to stop, then just gave Pantheon the go-ahead. He stepped forward and used the pointy end of his spear to cancel her recall. It also awarded him 15 gold. Now we wanted to have a similar situation; Vayne caught by herself so she wouldn’t be able to escape or bring her team mates into battle, and have her attack Lux. Eventually the situation arose and Vayne took the bait. However, immediately after finishing off Lux she ulted, rolled, and then flashed to get distance from a then 10-2 LeBlanc. I had no intention to kill her, we simply needed Vayne to be worth money again. I congratulated Vayne on her heroic ability to run away so cleverly, and Riven interrupted to tell Vayne, in all-chat, that we let her have a kill so that she would be worth money again. I scolded Riven for having such a terrible idea. Of course we wouldn’t do such a thing! Vayne simply outplayed three very fed champions while she was 0-16! It could happen! Don’t crush her dreams! The feast continued. We were chatting with the other team, they were chatting with us. We were apologizing that the game got so skewed so fast. They were very understanding. However, the wouldn’t surrender. We never asked them to, it just seemed strange to be down so many kills and not surrender. So we developed some more games. I started to let Taric stun me. It started when I was attacking tower with a creep wave nearby. Taric came to defend. Knowing that I could kill him he bravely walked forward and used Dazzle on me. I stood still for a second or two as he retreated as quickly as fabulously possible. I continued to attack the turret and simply wrote “ow!” to which he responded, “I can’t do anything!” From that point on I would let Taric Dazzle me without any repercussions. I felt bad for the support in that game. I’m sure he did all he could for his AD, but Vayne going 2-25 was anything but his fault. Rumble remained frustrated all game. I could understand his frustration, LeBlanc can be a strong pick for a blind pick game. Being melee versus LeBlanc is not something people enjoy. Congratulations to Akali for going positive in a game this one-sided. Thanks to everyone else on the team for staying positive and not raging. We made a new ranked team! This was a massive undertaking that took weeks of planning and thought and emails and team crafting and theory crafting and… You get the idea. Well, we didn’t like where that took us, so yesterday we just said “screw it” and jumped into the ranked queue! We told ourselves that we would ban Ezreal if we were second pick and pick him if we were first pick. We were second pick, but the other team banned Ezreal for us, so we didn’t have to. Let’s go through the pick stage though. First pick Varus. I guess with Ezreal out the other team felt very comfortable on Varus. We picked up Tristana and Nunu. Nunu was going into the jungle, but the other team didn’t know that. The other team picks Sona and Vlad. Silly kids, they thought we wouldn’t have any sustain in bot lane. Well, we out-smarted them by conforming and picking support Morgana and Lux for mid. 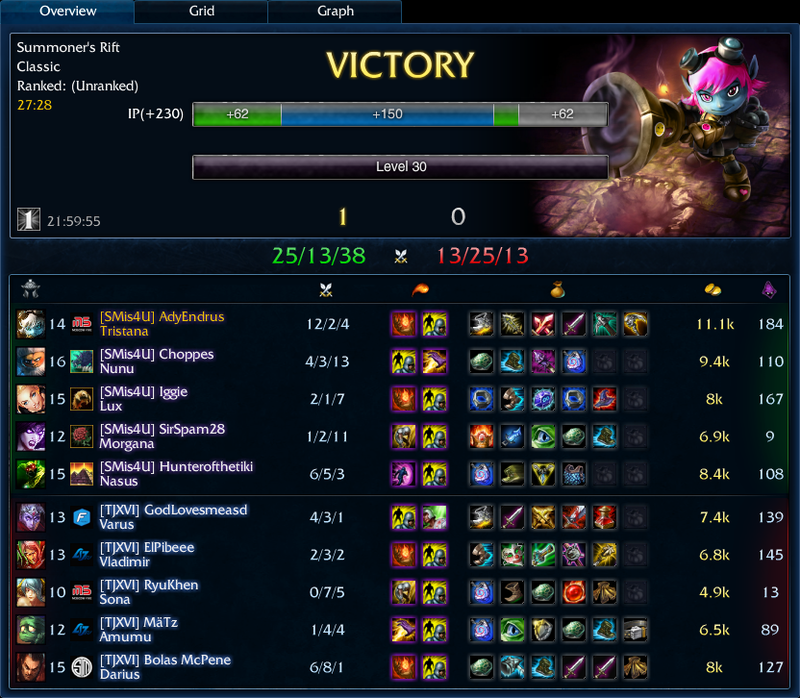 The other team countered with Amumu and Darius. Oh no. I hate Darius. I don’t like his kit. I hate that if he hooks you, you burn flash. That drives me crazy. He’s too dangerous without damage items. Oh well. We’ll send Steve up there anyway. Best of luck, Steve! Steve picks Nasus. It actually worked better than I thought it would. Level 1 we’re just minding our own business in bottom lane when Amumu, Varus, and Sona come walking in behind us in river. Game on! Our first instinct is to run once we see three. 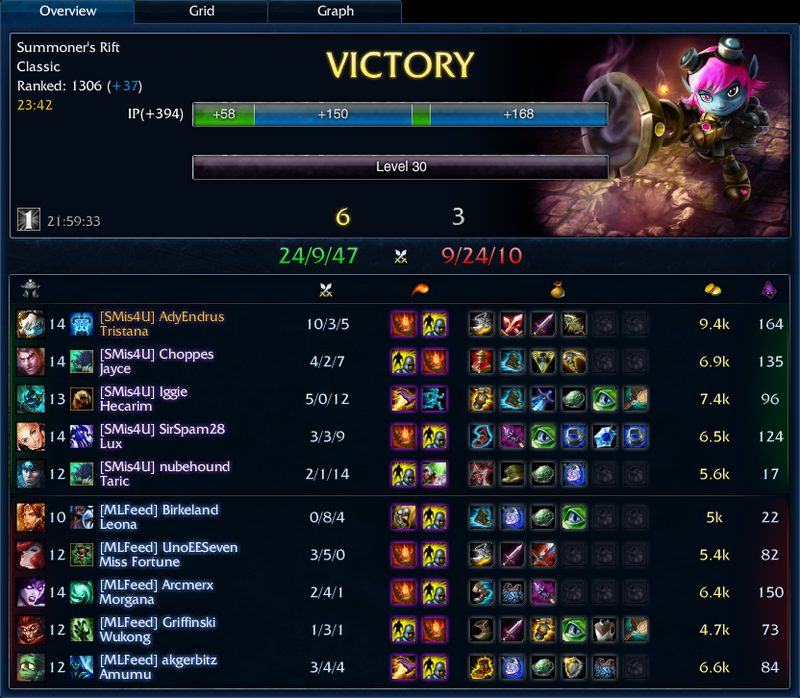 However, Sona is already low from helping Amumu steal our blue. I ignite and start hitting her with autos. I flash to match her flash. One more hit, but she’s under tower. I get the first blood on Sona, and turn to see Amumu and Varus. Then a wild Nunu appears. We had helped him steal the enemy red, so he was in the bottom jungle, ready to wreck some kids. He helps to DPS Varus so even though Varus used summoner heal we still kill him before he can get out. Amumu is crying at my feet, probably because of the double kill I just got, but that double kill, combined with the creep wave that I got to soak up before they showed up ticked me up to level 2. I quick level into my rocket jump and away I go! See ya, suckers! Double kill for the ADC? What a great way to start the game! Blood Boil OP! I won the race to Infinity Edge, then got my Phantom Dancer, and was going to get a Last Whisper, but the crits were too much. 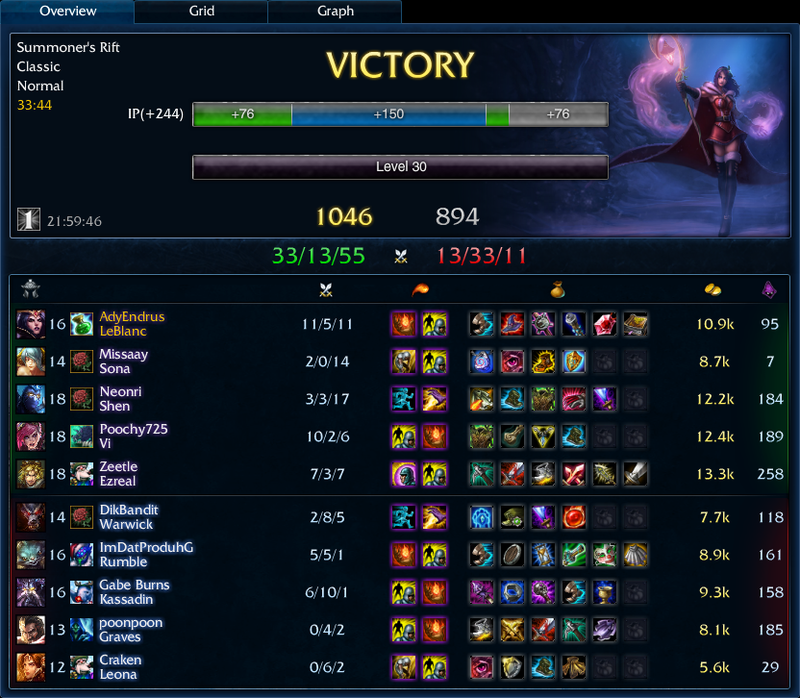 I was somewhat frustrated with my mid-game because I kept getting bullied by Sona and Varus. Their combined poke burst was too much for my small health pool. I guess I was too used to playing as Ezreal and having Dorans and Phage. I also prefer to just sit in bot lane and farm until I’m huge and then team fight and get my kills that way. I felt like the way that bottom lane was going I kept missing lots of experience and gold from waves that I had to miss because I was too low. I would have Varus and Sona tower dive me if I was at or below half health. It was VERY annoying. However, the feeling of just mowing stuff down later was priceless. I haven’t felt like that on Ezreal because I don’t get as much crit through Trinity Force as I would with Infinity Edge and Phantom Dancer. Box of Chocolates OF DOOM! I actually managed to get first blood on Darius as he tried to last hit the wave that I had pushed. Right after that I backed off, afraid of where Nocturne would be. However, my jungler pointed out that he was being counter-jungled at the moment; Nocturne was at our Elder Lizard buff. I bunny-hopped down there to see the little minions resetting. Our poor Rammus was right, Nocturne was taking the jungle, no regrets. However, I found a 200 HP Nocturne taking our Wraiths. Goody! Free red buff for Teemo! At this point Darius gives up. He sees me with first blood (and second blood) and a red buff. However, it’s shortly after this that I make my first mistake. I push Darius out of lane with red buff. He’s forced to take harass and try to last hit with his Q. I freeze the lane and take a lot of CS that Darius can’t reach. I go back, buy wards and health pots and come back to lane. I ward the river, and leave a couple Easter Eggs down there as well, and walk back to lane. Before I can step out of river bush Darius goes balls to the wall on me. I’m confused because I’m so far ahead that he’s not a threat. Then Nocturne is standing next to me. Level 5 Nocturne. How did Nocturne get next to me, you ask? I have no idea. It’s my mistake, somehow pre-ult Nocturne had managed to stealth into my lane and catch me at the mouth of river. I was standing in the bush so I knew he wasn’t in there. I had a ward at the opening to blue and 10,000 mushrooms in the bush behind. Yet, I knew I was dead. I have my long walk of shame back to the lane. Now Darius is really going to pay. I abuse Darius so hard that he rages in all-chat and then swaps for mid. I actually suggest the change so they won’t surrender right away. Vlad comes top. I go to auto attack into a Q and another auto attack, but Vlad just pools after my first auto, so he loses 20% of almost his full health pool to his escape spell. As soon as he shows himself again I commit. I know his W is down, I get my ignite on early to stop his initial lifesteal from his Q. I flash to secure the kill and stay with him. He disappears off the screen trying desperately to heal off something, but nothing can save him now. Wait for it. Wait for it. Wait fooooooooor iiiiiiiiiiiiiiiiiiiiiiit. Killing spree. I push lane, take turret and steal blue. Now I have complete control. With blue buff I can abuse their jungle and put shrooms all over the place! Now the fun starts! I literally had a 1v4 fight that I managed to prolong with mushrooms. First it was Nocturne and Soraka. Soraka baited me out and then Nocturne ulted with her vision. I was surrounded by shrooms, so Nocturne was already hurting by the time he got to me. I dropped Soraka and saw that I had enough damage to kill Nocturne once the fear wore off. That means that I have double buffs! I start working my way back up my lane because I’m down to just a few hundred HP. Vlad shows up. He wards the tri-bush that’s up and to the left of blue-side’s blue buff. I’m not in it, but a present is waiting for him in there. He steps on it, bringing him critically low. I don’t know if he has pool, but I wait for him to use it before I take a step in to secure the kill. Then Darius, desperate to exact his revenge, he comes crawling through a minefield of shrooms, losing all of his HP before reaching me. However, I’m equally low after battling the rest of his team. I run up the lane, taking time to put a ward at the mouth of river and right between the two bushes of top lane. Darius just wants to get me in range. If he can land his pull he can press R and kill me. He knows it. I know it. I’m dancing just outside of his reach, so I throw him a bone. I step in towards Darius, dancing on the furthest range of his pull. He tries for it. No dice. I auto attack with poison and red buff and Q him and start to recall. He’s slowed by my buff, I’m outside of his range, and his pull is on cooldown. Sion appears out of the river and finishes off Darius as I finish my recall. Sometimes I just like to rub it in. After my last purchase I was able to pick off Soraka in top jungle again (I have no idea what she was doing there) and then I heard the lovely sound of “Legendary!” being screamed by the announcer lady. I almost got away, just died to a Nocturne ultimate. I think he finally timed his spell shield to block my blind instead of my DFG. Once they killed me, they promptly surrendered. I received no “Honorable Opponent” credits from the other team that game, but thoroughly enjoyed myself against champions that I thought would give me a lot of trouble.